In a small sauce pan, bring the sugar and 1 cup of water to a boil. Sir occasionally until sugar dissolves completely and turns into a syrup. Let cool. 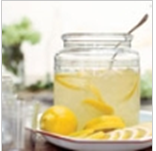 In a large pitcher/jar, stir in the syrup, unstrained lemon juice, maple syrup and 4 cups of cold water together. Chill in the fridge or serve over ice. Add mint for an edible decoration.